Welcome back to a new challenge with the Paper Craft Crew team! I hope you had fun with the last sketch challenge; it was for 2 weeks, so hopefully you had time to get your card linked up. So, the choice is yours for this one – just as long as it’s a Fall theme, your project is fair game! I decided to stay close to the theme; I’m a September baby (the 23rd, right after the 1st day of fall! ), and I just love the rich jewel tones of the season. 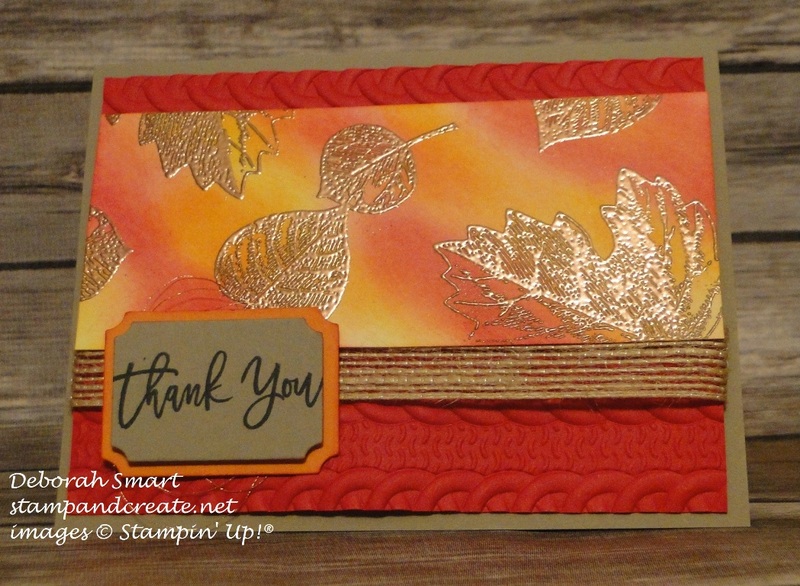 Fall is also ‘sweater weather’, so I thought it appropriate to combine the Vintage Leaves stamp set with the new Cable Knit Dynamic Textured Impressions Embossing Folder. First, I started with a card base of Soft Suede cardstock. I took the panel of Real Red cardstock, and lightly spritzed it with water, using a Stampin’ Spritzer. Doing this loosens up the fibers in the cardstock, to allow for the deep texture of this embossing folder, without cracking or tearing the cardstock. To create the background panel, I took a piece of Whisper White cardstock, and used Sponge Daubers to apply ink in Real Red, Pumpkin Pie and Daffodil Delight. I started out applying them lightly, then went back and added more colour where I wanted it. I then used the Vintage Leaves stamp set and stamped 3 of the leaf images in Versamark ink, then covered them with Copper Embossing Powder. I just love watching the ‘magic’ of heat setting the embossing powder, and watching the glow of the copper show! I attached the stamped panel at the top of the Cable Knit embossed panel, then added a length of the new Burlap Ribbon underneath. The sentiment is from the Thoughtful Branches stamp set; inked in Memento Black in onto Soft Suede cardstock. 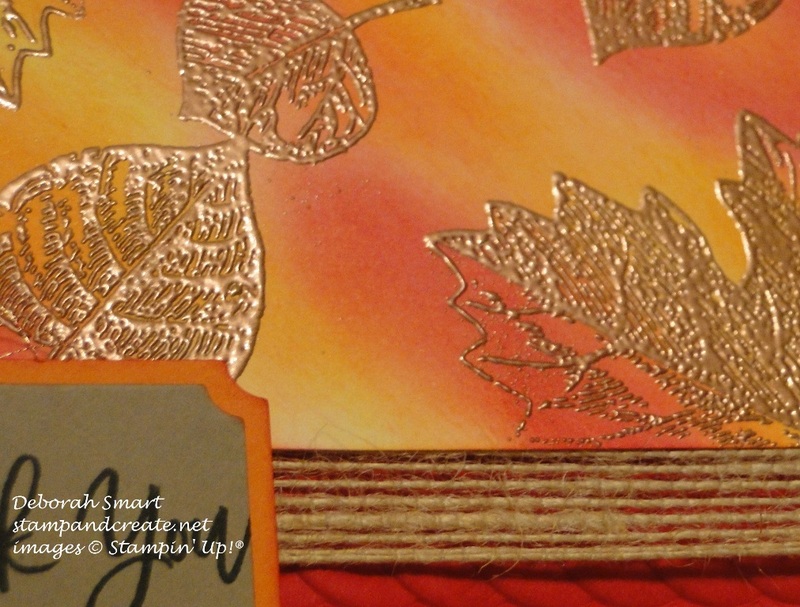 I used the Tags & Labels Framelits to die cut the sentiment, and the Pumpkin Pie cardstock layer beneath it, and attached them to the card front with Stampin’ Dimensionals, after adding some loops of the Copper Metallic Thread behind them. Once I had the idea in my head, the card came together quite quickly! Let me know what you think – do you like getting inky, creating your own backgrounds? Previous Previous post: Another Fun Kick-Off Party! This card is beautiful, Deborah. I love the colors and the way you sponged the background. Gorgeous! Saw your card on the PCCC site and love it. Those embossed leaves are gorgeous! TFS. Thanks so much for visiting from the PCC site to leave such a nice comment, Susan K! I really appreciate it. The new copper embossing is just gorgeous, I agree!